Now that you’ve read my review of Control Unleashed, you may be wondering why exactly, does Control Unleashed work so well? If you’re like me, and enjoy knowing the nuts and bolts behind things, you will find the following article by Chrissi Schranz very informative. This article originally appeared at http://poodle-power.tumblr.com/post/61746514573/neuropsychological-foundations-of-cu-training and was written by Chrissi Schranz (Full member of Association of Professional Dog Trainers). It is reposted here with permission of the author. CU devotees know to always work below threshold, that is to say to lower criteria to a point where we can be sure our dog will succeed, and to avoid causing over-arousal. For example, when working with a dog-reactive dog, we’ll keep our distance to other dogs. Rather than “flooding” him with the company of another dog, we’ll stay at a distance where he’s not worried. Depending on the individual, that may be the length of a soccer field, across the street, ten meters or two meters. For a dog suffering from separation anxiety, this means we wouldn’t leave her alone any longer than she’s comfortable being alone. Depending on the individual, that might mean 30 seconds, 2 minutes, 10 minutes or two hours. The threshold is the point where a dog overreacts – e.g. the distance where where the dog-reactive dog starts lunging, jumping into the leash and barking, or the time after which a dog suffering from separation anxiety starts getting worried and working herself up. We can look at the threshold as the frontier separating “thinking brain” from “instinct brain”, or as the line separating cognition from emotion. Below threshold, the actions are controlled by reflection and conscious decisions. Over threshold, the emotions take over and reactions are automatic rather than deliberate. Whether an action is based on cognition or emotion depends on whether it is dominated by the cerebral cortex or an area of the limbic system called the amygdala. Both cerebral cortex and limbic system deal with environmental stimuli and work together when causing the release of hormones and neurotransmitters that generate a response. However, they are inversely proportional: the more active the cerebral cortex, the less active is the limbic system, and vice versa. Depending on which area dominates the reaction, we either get a predominantly cognitive response (limbic system is dominant) or an emotional response (amygdala is dominant). That is to say, when we work below threshold, the cerebral cortex dominates behavior and we get a deliberate response; when working over threshold, the amygdala is dominant and we get an overreactive response. These are important points to consider in dog training. Working below threshold, a dog will be able to take in and process information, learn new things and pay attention. Because his actions are dictated by the cerebral cortex, he’s in a receptive state of mind; an ideal training condition and, moreover, a state of mind that lets your dog relax and be comfortable. On the other hand, a dog who’s over threshold is subject to behavior triggered by the amygdala. His responses to environmental stimuli will be emotional, indeliberate and unreflected. In this state of mind, it is neurologically impossible for a dog to think clearly, to process information “objectively” and to take in new tasks. A disobedient dog over threshold isn’t stubborn; rather, his brain and hence behavior are dominated by the amygdala, while the cognitive cerebral cortex is blocked. Rather than getting mad at her for failing to listen to your cues in a distracting environment, you should ask yourself how you can change the environment/lower criteria in order to enable your dog to get back in a cerebral cortex state of mind and succeed. Acute stress causes high activity in the amygdala. The dog’s body prepares for fight/flight/freeze/flirt, and training, attention or obedience become neurologically impossible. This is why the common practice among dog trainers to ask a dog to perform among all kinds of conditions in all kinds of situations from the beginning is counterproductive and doesn’t tend to work. Effective training starts well below threshold and only gently and slowly raises criteria. With mutual trust and practice, the threshold recedes. You may then raise criteria at the same speed the threshold withdraws, but never cross it. What do you do if your dog is reactive in a situation you can’t or don’t want to avoid? How do you get her threshold to recede without flooding her with stressful experiences? Leslie McDevitt suggests targeting in order to get your dog to focus and make it easier for him to stay in his “thinking brain” in a distracting or stressful environment. In this context, targeting means turning environmental stimuli into cues. This could be tactile targets such as getting out of the car and (A) targeting the door to the training facility, then (2) targeting the dog’s crate, and then (4) targeting her mat etc. With the help of intermediate targets, a seemingly long and distracting path is broken down into little steps that are easier for the dog (or human) to take. The targets could also be visual, such as using scary things as a cue to play the “Look at That” game and earn treats. Indeed, by means of targeting strategies, overreactive dogs are more likely to stay calm. Neuropsychologically speaking, why is that? If a dog’s attention and focus are held by a well-known game, the cerebral cortex dominates his response. As mentioned above, cerebral cortex and limbic system are inversely proportional, and the activity of the limbic system is kept low when your dog operates from his “thinking brain”. Keeping the cerebral cortex going in stressful situations helps your dog to cope with them rather than going over threshold. Targeting games are a very effective way to accomplish this: the distracting environment itself provides the cues for the cerebral-cortex dominated behavior, and the more you practice, the more you accelerate calm default behavior. An example: Phoebe knows hand-targeting. If we’re about to cross a busy street, she sometimes gets excited and wants to chase cars: for her, the cars are a trigger causing action in the amygdala. One strategy I use for dealing with this is that I ask her to target my hand with her mouth while we’re waiting for the pedestrian light to turn green: touch my hand on the floor, in the air, next to you, behind you. Phoebe likes the touch game, and it keeps her focused on me rather than the traffic. Also, the more often I play the touch game with her in this situation, the more she’ll get used to not lunging towards the cars. While focusing on my hand, she peripherally takes in the traffic without getting emotionally glued to it, and while this experience is repeated every time we play the touch game near a busy street, she gets desensitized to the traffic trigger. Nota bene: in behavioral therapy, desensitizing only works as long as you stay below threshold! This month’s article is by Maja Wichtowski of Tsavo’s Canine Rehabilitation & Fitness Center, Inc. A graduate of Cornell University, Maja has 18 years of extensive experience in Western Veterinary Medicine. Her diverse background includes oncology, orthopedics, internal medicine, dentistry, emergency/critical care, general practice and canine rehabilitation. We inquired about the most common canine injury, the CCL-Cranial Cruciate Ligament. Regardless if your dog is a sport athlete in Flyball, agility, herding, frisbee, playing at the dog park or a weekend exercise hound it is important to seek medical care with any injury. Maja provides an overview of treatment options for the dog owner when injury unexpectedly occurs. Maja may be contacted at: Tsavo’s Canine Rehabilitation & Fitness Center, Inc. So your dog tore their CCL, now what? For most, our 4-legged kid’s favorite game is playing ball. All is good until suddenly you hear a scream and your dog returns 3-legged. Is surgery always necessary? What if my dog cannot undergo anesthesia? Is rehabilitation always necessary? We hope to clarify your options. If you dog does suddenly become lame, it is imperative that you get them to your veterinarian immediately. Your vet can determine the cause for the lameness. 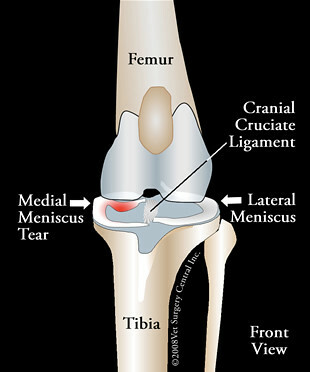 If it is a CCL(cranial cruciate ligament) injury, and it is left untreated, joint degeneration progresses quickly and full recovery becomes less likely. The longer your dog overcompensates with the opposite leg, the more likely that the CCL in that leg will also rupture. Then you have a dog that can’t walk at all! If your dog has completely ruptured their CCL, surgery is probably your best bet for a quick recovery and long-term stability. 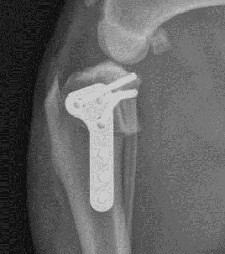 The orthopedic surgeon will determine which surgery is ideal based on your dog’s age, breed, weight, and activity level. 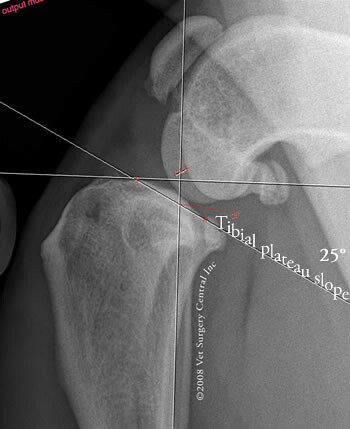 The two most popular surgeries are the TPLO (Tibial Plateau Leveling Osteotomy) and the TTA (Tibial Tuberosity Advancement). 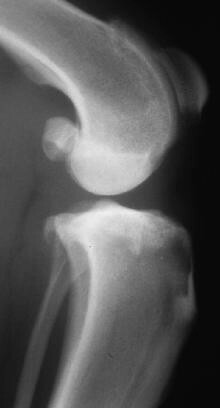 They both stabilize the joint by changing the joint’s anatomy, and involve the use of titanium implants. There is also Extracapsular Stabilization, which is the least invasive, but usually only used in dogs under 50lbs. Immediately following surgery, a combination of NSAIDS (non-steroidal anti-inflammatory), joint supplements, and physical rehabilitation are essential to ensure your pet recovers quickly. Full recovery commonly takes 6-20 weeks, and is dependent on the type of surgery performed, the age and weight of your dog, and how vigilant you are with post-op care. If your dog is lucky to have only suffered a partial CCL rupture, or if they are compromised in some way (health or age) that prohibits anesthesia, here are a few options that are available. A custom knee brace is an essential component to recovery if your dog is not undergoing surgery. It will provide stability and allow them to utilize the limb without further damaging the joint. Once you have a brace, stem-cell regenerative therapy or prolotherapy, and physical rehabilitation are the way to go. Stem Cell Regenerative Therapy requires a minor surgery to harvest the stem cells from your dog’s fat, as well as a repeat anesthesia to inject the harvested and processed cells into the knee the following visit. This therapy uses the same mechanism the body uses to repair itself; with the cells transforming into any kind of cell that is needed. Restricted activity, physical rehabilitation, and brace support, are key post-injection for the best results. Prolotherapy also uses your dog’s healing mechanism to treat the injury. In this procedure, a solution is injected into the knee directly, causing an inflammatory response which in turn starts the healing process. Your dog will need to be sedated for this procedure, which is usually repeated monthly for 4-6 injections. Post-injection protocol is the same as with stem cell therapy. I hope that we were able to give you a good core understanding of your choices of treatment should your dog ever suffer from this kind of injury. Regardless which route of treatment you and your veterinarian decide on, the benefits of post-op physical rehabilitation shouldn’t be understated. The sooner you start, the sooner your dog can be back on their feet enjoying life pain free. Please feel free to contact us directly if you have any further questions. 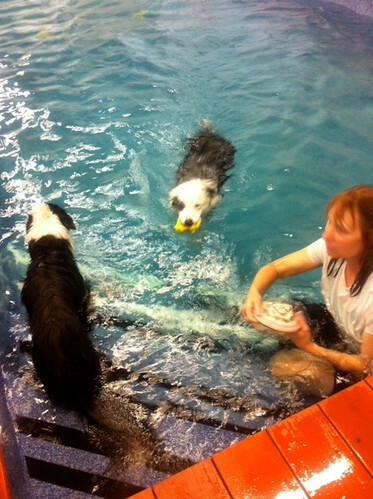 Tsavo’s Canine Rehabilitation & Fitness Center, Inc.
One of the best activities in keeping your dog fit is swimming. This low impact exercise benefits dogs through out their life; pup, adolescent, senior and geriatric. The benefits of this non weight bearing exercise is idea in improving flexibility, muscle tone, range of motion, weight control, post surgery workout and endurance conditioning for sporting dogs (flyball, agility and herding) and “pet” dogs. Ballistic Racers recently had the pleasure of being interviewed by the Union Tribune. A big hank you to the Union Tribune for taking the time to learn more about us, and the fantastic sport of flyball! 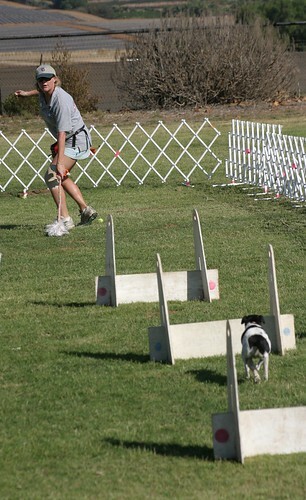 Fox 5 San Diego News, Woofstock interview with Canine Companions for Independence and Ballistic Racers . Touch N Go from Las Vegas, the world’s fastest flyball team, came to share their expertise with our team, Ballistic Racers. It was an all day affair at Skydance Ranch in Oceanside, California, on a Saturday which was warmer than usual. With their three trainers and one helper, Touch N Go dealt with many issues. Several landmark accomplishments were met as our dogs made vast improvements. Katy, Nadine, and Stephanie, used their expert techniques to individualize instruction, helping each dog to be the best it could be.